Some animal species strictly consume plant matter, some are big meat eaters and others dine on a healthy mix of both. 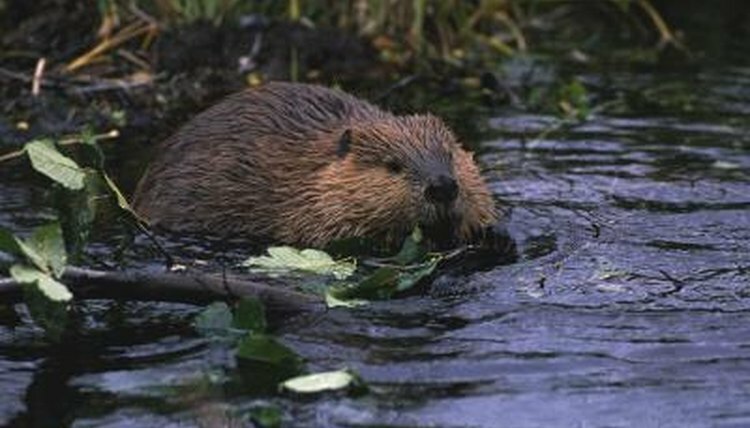 Beavers are a prime example of those that eat vegetation only, the herbivores. Beavers are large rodents that definitely enjoy vegetation -- including twigs, foliage, bark and aquatic plants. Beaver diets are not fully consistent; they change by the season. In terms of diet, woody plants -- typically the inner bark of trees -- are a beaver favorite, according to the New York State Department of Environmental Consumption. This is especially true during the cold winter months, although woody plants still make up roughly half of what they consume during spring and fall. During the warm summertime, woody plants usually are only about 10 percent of a beaver's consumption. Aspen trees are usually the preference, although beavers feed on black cherry, beech, maple, alder and birch trees as well. Apart from just the bark, beavers enjoy eating the "cambium" of trees, which is the name for the very soft and smooth layer just below the bark. When it comes to woody plants, beavers do not stop at the bark and cambium. The animals also frequently consume the twigs and foliage of various trees, especially red maples, willows and aspens. Rather than consume copious amounts of woody plants during the summertime, the beaver eats mostly aquatic plants and sedge plants. Rhizomes, pond weeds, bulrush, cattails and water lilies are just a couple of common summertime beaver "dishes." In the spring and summer, ferns, leaves and grasses are all big components of beaver meals. Although beavers are big swimmers, fish are generally totally secure while in their presence. The vegetarian beavers actually help to spruce up the fish's living environment by eating aquatic plants. Beavers and fish coexist in harmony. Grand Canyon Trust: What Do Beaver Eat? What is the Prey of the Kodiak Bear? Are Hostas Poisonous to Dogs?